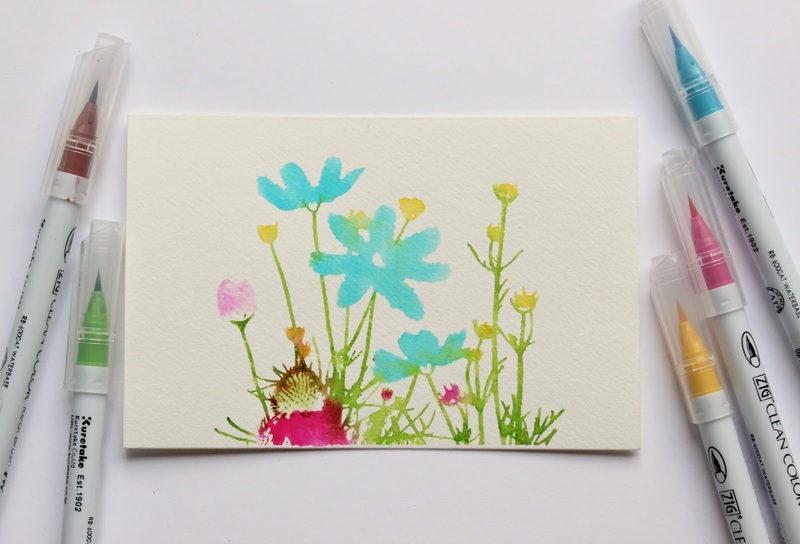 Cassandra here today with a watercolour card made from a silhouette image. I am very excited about many of the new products as part of the Spring/Summer 2018 release. I am especially loving the new silhouette images and the possibilities that they possess. 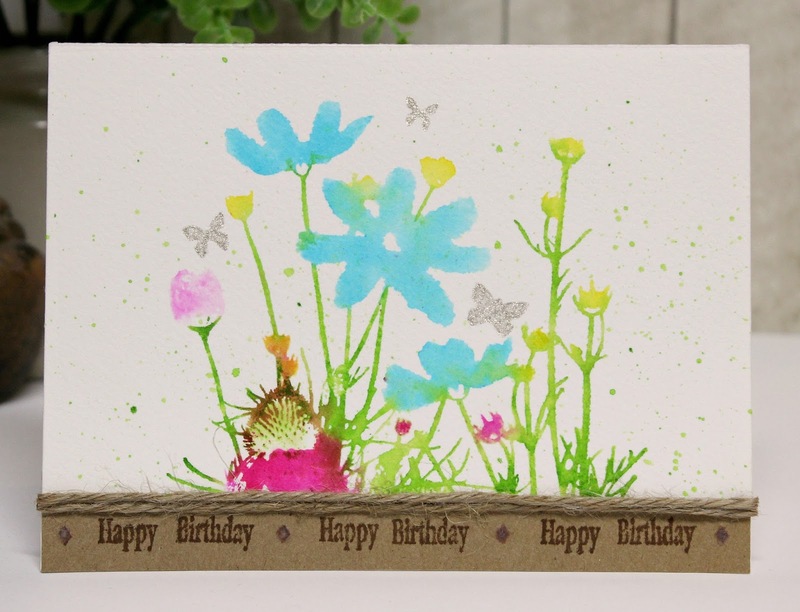 For my first creation from the collection, I made this birthday card with the Spring Silhouette Flowers using a MISTI and Zig Clean Color Real Brush markers on 4" x 6" 140 lb cold press watercolour paper. I began by using the markers to individually colour sections and then spritz them with water before stamping onto the paper. 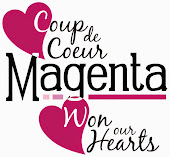 That is the beauty of using a stamp positioning tool as you can do things with your stamped images that would be virtually impossible to do without them. I started with the yellow flowers. Then, I did the pink flowers. Next, the blue flowers and lastly, all the greens. As I transitioned between colours, I would clean off the stamp so as to not get mud. You can always go back in and repeat stamp a section until you are pleased with the colouring. I did go in and add a little brown to the echinachia centre in the end. Once dry, I ran the green marker over a small patch of my craft mat and added some water and then used a watercolour brush to add splatters. While it was drying, I cut a piece of kraft scrap paper to 1 1/2" x 6". 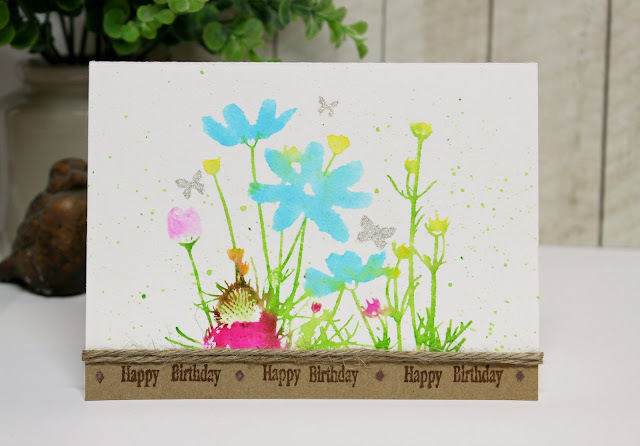 Using the MISTI, I stamped the Happy Birthday sentiment. Again, this was made possible because of utilizing a stamp positioning tool. I had cut the sentiment apart to that I could have the sentiment run horizontally verses its original stacked vertical positioning. I doodled in the diamonds between the sentiment repetitions. Now, I was ready to assemble the card. On a 4 1/2" x 6" cardbase, I adhered the kraft sentiment section to the bottom and then used a 4 1/4" x 5 3/4" piece of fun foam to adhere the watercolour panel at the top. Next, I adhered the two stripes of twine with one on the lower section and the other on the top edge. Lastly, I used the Flying Butterflies stencil and chose three of the smaller butterfly sizes to add the butterflies using a Stardust Gelly Roll pen to add a bit of sparkle. I hope this tutorial gives you some ideas to expand your thinking around silhouette images and their potential for beautiful colourful creations. Beautiful card Cassandra, love it!! This is so delicate and colorful! What a perfect way to say we are ready for Spring!